“Authoritative report of the physical science of climate change” begs the question: do the president and his agency heads talk to their own scientists? According to the Act, a Committee on Earth and Environmental Sciences composed of representatives of 14 federal agencies must issue an annual assessment that “integrates, evaluates, and interprets the findings of the Program and discusses the scientific uncertainties associated with such findings.” The new report leaves little room for uncertainty, however. In fact, it contradicts, in dramatic fashion, repeated statements by President Donald Trump, and key members of his administration, such as Rick Perry, Scott Pruitt, and Ryan Zinke who regularly deflect or outright deny the issue of climate change. The president’s climate denials are notorious and longstanding. Ironically, the report cites China’s reduced use of coal as a possible reason for a decrease in carbon emissions worldwide (P. 152). President Trump is committed to increasing the use of coal. This report strongly affirms both the reality of human-caused climate change and the human role in those changes. It also indicates that without strong action severe consequences—including up to 8.5 feet of sea level rise—are possible by 2100… The White House owes the public an explanation as to why their statements and policies are completely at odds with the best available science on climate change. 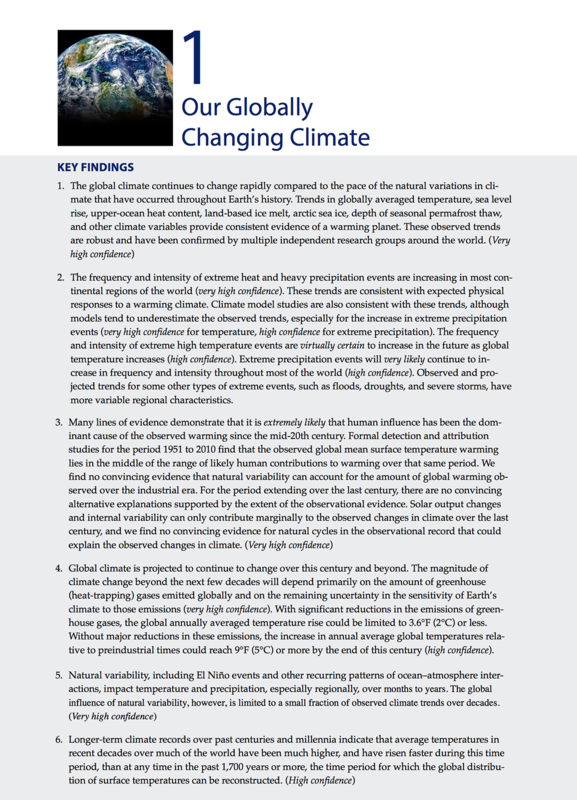 Key Findings from the Climate Science Special Report follow below. For the impacts of climate change by region and topic, follow this link. To read the report by chapter, follow this link. For a downloadable PDF of the full report, follow this link. The National Science Foundation, National Aeronautics and Space Administration, National Oceanic and Atmospheric Administration, Environmental Protection Agency, Department of Energy, Department of State, Department of Defense, Department of the Interior, Department of Agriculture, Department of Transportation, Office of Management and Budget, Office of Science and Technology Policy, Council on Environmental Quality, National Institute of Environmental Health Sciences.